I wanted to modify my templates. After converting a template to a VM I tried to edit the settings. 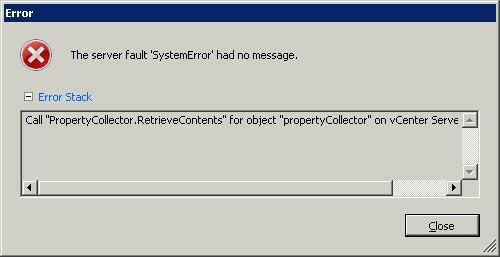 I received the following error: Call “PropertyCollector.RetrieveContents” for object “propertyCollector” on vCenter Server “VC” failed. I once learned this trick from my fellow worker Bert that also helped me to overcome this annoyance. I removed the VM from the inventory and added it again from the data store. Fixed. But what was the problem? It seems to be a combination of the upgrade to vSphere 4.1 and maybe even to 4.0 Update 2 before that, and the mounting of an ISO that’s in a datastore that doesn’t exist anymore. All fine again, moving on to the next error message. While browsing I came across a popup screen with the URL 14150cae.linkbucks.com. Code in this page opened up many windows in a few seconds effectively freezing my machine. It took me a while to startup procexp and kill my browser’s parent process. By then, malware was downloaded to my machine. It appeared to have settled in %APPDATA%\Roaming\DP32 by the name of display32.exe. It hooked itself into explorer.exe and started an invisible browser connection to some dsl customer of virginmedia.com on port 202. When killing the browser process, it was started again (of course). Putting deny permissions on the file took it out of business. It already dropped another copy of itself in %APPDATA%\Roaming by the name of svchost.exe, though. Also an autorun entry was made for this file. Deleting that and svchost.exe made it possible for me to reboot after intensive scanning. Online scans with McAfee, F-Secure and TrendMicro showed no other infections. Virustotal now shows that 21 virus scanners can identify the malware. Too bad my own virus scanner still can’t I submitted the file to them, so they should be able to soon. After you’ve upgraded your virtual environment to vSphere 4.1, you’ll have the option of upgrading your dvSwitch to version 4.1, too. This will give you 2 new features, namely Load-Based Teaming and Network I/O Control. In your network overview, click your dvSwitch. 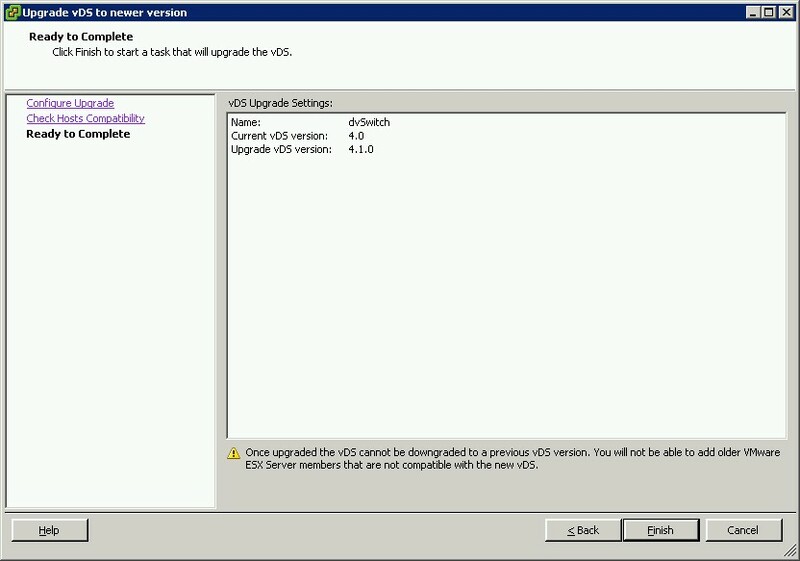 Click Upgrade to upgrade your dvSwitch to 4.1. Mind you, there is no going back, so double check if you really want or need this. You are notified of the new features. The software checks your hosts for the correct vSphere version. And click finish to complete the upgrade. The upgrade will be done in less then a second. 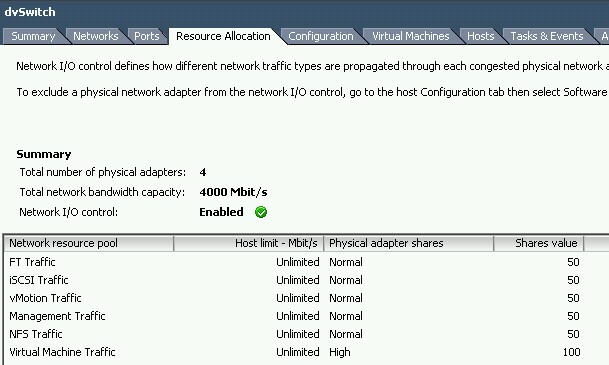 Unfortunately, I cannot test the Load-Based Teaming feature on my whitebox VMware cluster due to a lack of NIC’s. 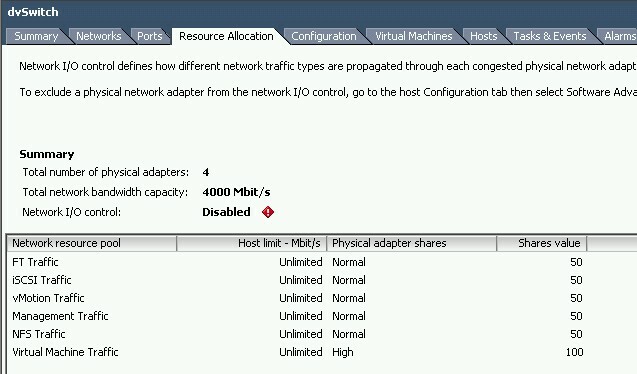 Now, to enable Network I/O Control, go to the Resource Allocation tab of your dvSwitch. You’ll see it’s disabled by default. Click the properties link on the right of the screen. In the popup window, enable Network I/O Control and press OK.
VMware vCenter 4.1 upgrade Error 1923. 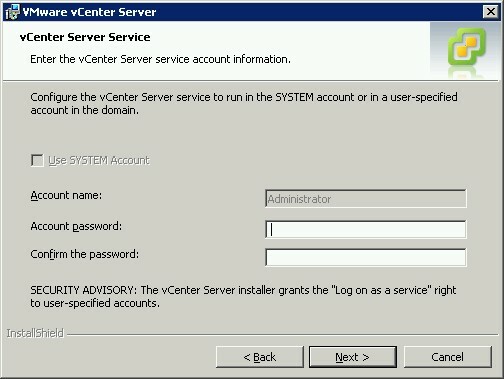 Service VMware Virtual Center Server (vpxd) could not be installed. I had to rollback the installation. But because my database was already converted to the new 4.1 format, I had no choice other then to fix this error and try again. When I saw the VMware VirtualCenter Server service was disabled, I thought that might be the problem. But when I tried to set it to manual startup, I received the error “The specified service is marked for deletion”. This gave me a hint to the very simple solution to this problem: Reboot the server and try the installation again. I changed the account for the services after installation. Please note that if you were running vSphere 4.0 Update 2, you actually go down in version number from 261974 to 260247. I didn’t notice this before, but it might be common for major upgrades. Even stranger is that the hardware status states I’m still running 4.0.0 build 261974. Weird. Update: After a few minutes, my hardware status was updated from 15 to 381 sensors =) I guess the agent was still collecting data when I first looked. The new sensor data shows the correct version.